R.L. 2.1- Ask and answer such questions as who, what, where, when, why, and how to demonstrate understanding of key details in a text. We always begin the year with asking questions (who, what, where, when, why and how?) and I start with a tactile experience. This ELA standard has been a foundational standard for my entire year and should be for every teacher. Remember, every question needs a response; verbally or orally. It’s a great way to help students elaborate sentences and dig deeper when reading various topics. My kids asked questions all year long and I used this standard and props to help build sentences whenever possible; even to the point of ending lessons with a “teach-back” using our question cards in a whole group or collaboratively with partners. I laminated cards for regular use and copied several for collaborative groups/partners. We used the cards before, during, and after reading across all genres and subjects. 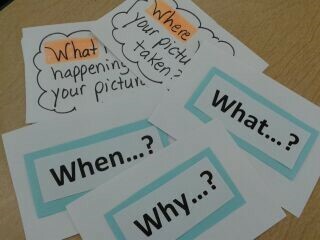 Encourage your children to use these cards regularly as prompts to always ask questions and dig deeper. Imagine using small question cards (who, what, where, when, why, and how) to match parts of a sentence. 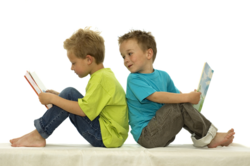 This allows children to determine whether they elaborated enough. Once they match sentence parts with the question cards for practice, each student will write the corresponding sentence for practice. It is visual and multi-sensory. Find time every day to expose your students to writing and thinking about using question cards in various ways. Turn oral responses into written application and you will undoubtedly see improvement. I call this Props with a Purpose. Furthermore, I also created comprehension bookmarks with 6 sequential questions for them to easily answer and write retells; L.2.2– Recount or describe key ideas or details from a text read aloud or information presented orally or through other media; as well as recounting, writing narratives and discussion starters for small group collaboration and reading partners; just by asking questions- It’s more than the Common Core!